A multi-awarded veterinarian described on Sunday the pawikan conservation program in this province as a successful story that should go down from generation to generation. 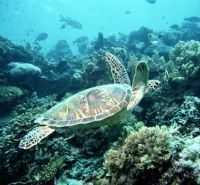 “It is good that Bataan gives importance to marine turtles or pawikan and time will come that tourists will flock more in this province,” said Dr. Nielsen Donato, one of the hosts of GMA 7 Network's Born to be Wild. Donato was guest of honor during the Pawikan Festival at the Pawikan Conservation Center in Nagbalayong, a village with sandy beach adjacent to the West Philippines Sea in Morong town. “This festival creates awareness, especially to the youth, and should go down from generation to generation,” the veterinarian known as Doc Nielsen said. He considered the conservation program in Bataan on sea turtles as a successful story. He said that former poachers who used to collect turtle eggs and butcher pawikan for sale and for human consumption have turned into protectors and conservationists. The former poachers are now members of Bantay Pawikan who are running the conservation center. “I wish other towns will do the same," Donato said. He said that a pawikan, after some years, comes back to the place where it was hatched. “The shoreline should be protected. Avoid building structure in the sandy area. Even if there are a lot of people, the pawikan will use them and lay eggs," Doc Nielsen said. Manolo Ibias, chairman of Bantay Pawikan, said more than 68,000 hatchlings have been released to the sea since 1999. He estimated that one percent of this number has the chance to survive and go back to Morong to lay eggs. To this number, 150 more day-old sea turtles of the Olive Ridley species were added and released to the sea Sunday morning. Donato and Garcia were among those who enjoyed releasing the hatchings on the sand to the sea. "There are more and more pawikan that come back every year which is good to the eco-system," Governor Albert Garcia said. The governor said that through the pawikan festival and the conservation program, they have learned that conservation of the environment and development which is the life-support can go hand-in-hand. "The former poachers who are taking care of the pawikan are now lecturers," Garcia said. The Pawikan festival started with a Walk for a Cause and morning exercise. After the ceremonial release of hatchlings, street dancers in pawikan-inspired costumes showed their talent on the sandy beach. There were mural, body and boat painting contests, nature’s camp, quiz bee, sand sculpture, pawikan amazing race and beach party.